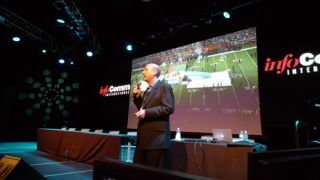 Registration is still open for the InfoComm/NewBay Media Rental & Staging Roadshow, Orlando edition, set for next Tuesday, Sept. 17th at Full Sail University. The event will feature a full day of education, tech tool demos, and networking that takes full advantage of the unique venue– the Full Sail Live venue, on the Full Sail Campus in Winter Park, FL, minutes from downtown Orlando. Midori Connolly will present, explaining new tools to cater to the hyper-connected group of people at today’s live events who want to interact with the content not be passive "audience"– and even drive, to some extent, the overall experience they have at an event. Midori demos in her presentation a variety of specific Apps– beyond just social media apps– for presenter/audience interaction and large screen/small screen interaction. And we’ve also put together a special Roundtable — where a select panel of some of the country's top players ask and answer: Are You Ready for a New Staging Industry Landscape? On the panel will be: Les Goldberg, CEO of LMG; Tom Kervitsky, TEK Productions; Colin Murphy, Bungalow Scenic Studios; and Kevin McKnight, General Manager Orlando, Production Resource Group. Les Goldberg, the president and CEO of LMG– one of the world's most successful staging companies– will anchor a special panel discussion the Roadshow at Full Sail. Full Sail University, NewBay Media, and a special guest will outline the latest developments and techniques for video network and media server workflow, for live event production. Midori Connolly (who will present at the Full Sail Roadshow Sept. 17th) shown here at the July 31st Roadshow in NYC, explaining new tools to cater to the hyperconnected group of people at today’s live events who want to interact with that content– and even drive, to some extent, the overall experience they have at an event. Midori demos in her presentation a variety of specific Apps– beyond just social media apps– for presenter/audience interaction and large screen/small screen interaction. Midori Connolly will explain how Social media has created an environment where multi-directional communication and a high-level of interactivity are the norm– and she’ll show you specific new tools and Apps to stay ahead of the curve. People are no longer only educated by professional instructors, but rely on their peers for information and learning. No longer do they want pre-selected content thrust at them from a big screen, but they want to live inside of an experience, and help create it as they go. From hybrid events to the second screen, content consumption is about an on-demand, digital medium. How do stagers keep up with this trend? A look at trends and at specific Apps and platforms. 1:15 - 2:00pm: (Optional) Tour of Full Sail facilities for Roadshow professional attendees and Video and ProAV industry manufacturers. 2:15 – 3:30pm:Special Session: Industry Roundtable: Are You Ready for a New Staging Industry Landscape? Top industry players will address what it takes to succeed in this market– whether you’re just coming out of school/training or repositioning your self or your company for a “new normal”.